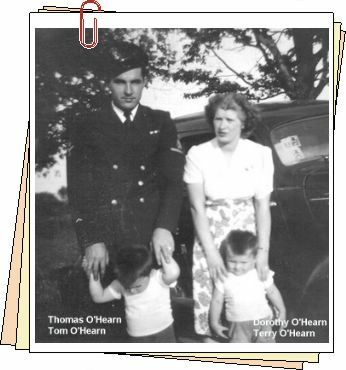 Thomas Joseph (Tommy) O’Hearn was born on September 22, 1919, at the family farm near Gananoque, Ontario, to Michael Edward O’Hearn and Anna Grace O’Brien. The farm was located at what was then known as Sidley Hill, on Highway 32, several miles north of Gananoque. His mother died shortly after childbirth on March 2, 1928, when he was nine years old. One baby girl was dead at birth, and the other twin, his sister Rose, came to be raised by their aunt Elizabeth (Liza) Kenney, nee O’Brien, and uncle Captain Wilfrid Kenney, in Elgin, Ontario. This left his father with Tommy and three other siblings: Loretta, age 10; Edward, age 6; and Andrew, age 3. Very soon his father Michael married Theresa Jordan, who was a wonderful stepmother to all the children. Not much is known of the early years, except that he attended South Lake public school, SS #11, a one room school located about a mile and a half from their farm. His own children would later attend the same school. He was also, like his father, a very good horseman. His sister Loretta fondly remembers her brother picking her up after school in either the horse and buggy, or horse and sleigh. After school, he sailed on the Great Lakes (lake boats), at times with his uncle Captain Wilfrid Kenney, mentioned in the second paragraph. He worked in the engine rooms of the ships, and his mechanical aptitude was also showing in his love of driving and fixing cars. This experience on the lake boats proved valuable when he joined the Royal Canadian Navy Volunteer Reserve at the start of World War Two (RCNVR History). Tommy served in the Navy for the duration of the war, and was discharged as Stoker Petty Officer First Class. 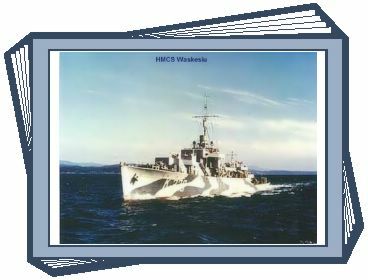 He first served on the corvette HMCS Fredericton, and the convoy duties of that ship were mainly uneventful (Read ship's history). He saw more action when serving aboard the frigate HMCS Waskesiu, and was in the engine room when the Waskesiu sank the German U-Boat U-257 on February 24, 1944, in the north Atlantic. It was the first submarine kill of the war for a Canadian frigate (Read full story). Tommy married Dorothy Catherine Watt, of River John, Nova Scotia, on October 4, 1940. There were two sons born during the war: Thomas (Tom) on September 19, 1942, and Terrance (Terry) on September 9, 1943. When the war was over, they moved to Elgin for a short time, before settling on a farm near Gananoque, about a mile from where Tommy was born. His uncle Tom had previously owned the same farm many years before. Three more children were to be born after the war: Peter, May 4, 1946; Richard John (John), October 16, 1949; and Christine Anne (Chris), January 15, 1954. For several years Tommy worked at Stelco (Steel Company of Canada) in Gananoque, and at the Kingston Shipyards. Most of his career, however, was spent at the central heating plant of the Barryfield military complex near Kingston, where he was a stationary engineer. This was the work he loved, and was similar to his work aboard ship during the war. During most of those years he also operated the small dairy farm. It was done with real horse power, long after most area farmers were using motorized tractors. In his final years, Tommy lived in the Kingston area, and purchased and sold several homes to pass the time. His wife Dorothy had passed away in May, 1976, and after retirement, time weighed heavily on his hands. On March 10, 2004, Tommy O’Hearn passed on peacefully, and has been reunited with Dorothy on the other side. He had dealt with both Parkinson’s Disease and Alzheimer’s Syndrome the final few months. His life was a journey touched with both heartache and failure, which ultimately led Tommy to appreciate the value of love and success, and thus to have had a fulfilling life.